Red Sox Nation has incredibly fond memories of 2004. From breaking “The Curse” to winning that first World Championship in 86 years. Ahh, it was a great year. Are we getting a second chance to relive it? Is it Déjà vu all over again? The scenarios played out slightly different, but the story lines are just as compelling. A new GM hired a new manager and signed a bunch of crazy clubhouse characters. Sounds like 2004 so far. This year’s story may be sweeter because of season the fans had to endure in 2012 – not quite the Aaron “Bleeping” Boone knife to the heart of ’03 kind of revenge, but sweet vengeance nonetheless. Oh, and there’s that whole playing the St. Louis Cardinals in the World Series thing. Well, it is here, folks. 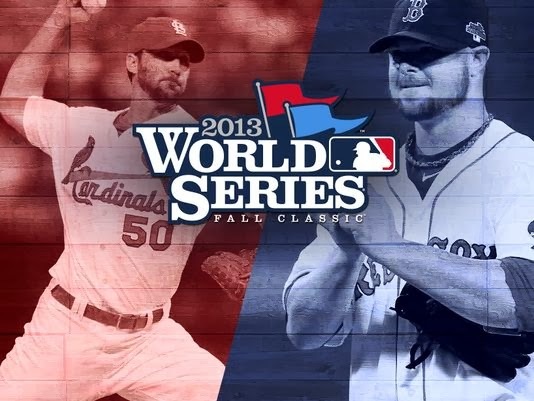 The 2013 Fall Classic is upon us and the Boston Red Sox are four wins away from a Duck Boat parade. Standing in their way are those pesky Cardinals once again. For the fourth time in their histories, the two clubs will meet for the World Series. The Cards took the first two in 1946 and 1967 with the Red Sox winning the aforementioned 2004 series. History doesn’t matter, though. All that matters is what happens between the lines of what looks to be one of the better matchups in World Series history. The Sox and Cards finished tied for the best overall record in Major League Baseball at 97-65. It’s the first time since 1999 that the two best teams from each league will meet in the World Series. The Pru. The Arch. Samuel Adams. Anheuser-Busch. The Kid. The Man. Fenway Park. Busch Stadium. Beards. Birds. Red Sox. Cardinals. Let’s get it on! On the mound for Boston will be Jon Lester, who has started Game 1 of each series this postseason. Lester is 2-1 with a 2.33 ERA this postseason and has continued to pitch well as he did the second half of the season. He has allowed just five runs in 19.1 innings during his three starts in the playoffs and his only loss was a 1-0 game against Detroit. The Cardinals will start ace Adam Wainwright tonight. Wainwright went 19-9 with a 2.94 ERA this year and, like Lester, has gone 2-1 so far this postseason. His lone loss was against the Dodgers in the NLCS, though he only allowed two runs on six hits in seven innings. He has gone at least seven innings in each of those three starts and has only given up four runs total in 23.0 innings. David Price, Matt Moore, Max Scherzer, Justin Verlander, Anibal Sanchez…those are the names of some of the pitchers Boston has faced thus far in the postseason. So Wainwright isn’t going to scare anyone in the Sox lineup, but he still needs to be taken seriously. The Sox had their struggles against each of those pitchers and there’s no signs pointing to anything different tonight. The key for the Red Sox will be to do what they’ve done all year – grind out at-bats. If they can knock Wainwright out early due to a high pitch count, the Sox will have a chance against the Cards’ bullpen. Unfortunately, St. Louis has a very solid ‘pen, unlike what the Sox saw with Detroit. Boston needs to have some early success at the plate and keep attacking the few good pitches to hit the Sox will see. Boston’s last World Championship came in 2007 and only four players remain on the roster from that squad. David Ortiz, Jon Lester, Dustin Pedroia and Jacoby Ellsbury each have a ring from ’07 and would like to add another to their collection. Ortiz is the lone man who has both the Sox rings from this millennium – 2004 and ’07. Once again, it will be important for the top of the Red Sox lineup to get on base early and often to put pressure on the Cards’ defense and pitchers. Ellsbury and Shane Victorino need to be terrors on the base paths if Boston wants a good shot at winning this series. It’s extremely obvious, but home runs and doubles are much better when runners are aboard. This is the 109th World Series with the AL holding a 62-47 lead. However, the NL has won each of the last three and five of the last seven – and the Cardinals have two of those…This will be Boston’s third appearance in the last decade (since 2004), the most of any AL team in that span. St. Louis is in its fourth since 2004, the most of any NL team. Each team has won two World Series since 2004…Boston has seven World Championships (1903, 1912, 1915, 1916, 1918, 2004 and 2007). The Cardinals have won 11 (1926, 1931, 1934, 1942, 1944, 1946, 1964, 1967, 1982, 2006 and 2011)…The team who has won Game 1 has gone on to win 20 of the last 24 World Series.